Cliff Outdoors Days Worth Fly Box was originally designed as a pocket box for guides on western rivers. 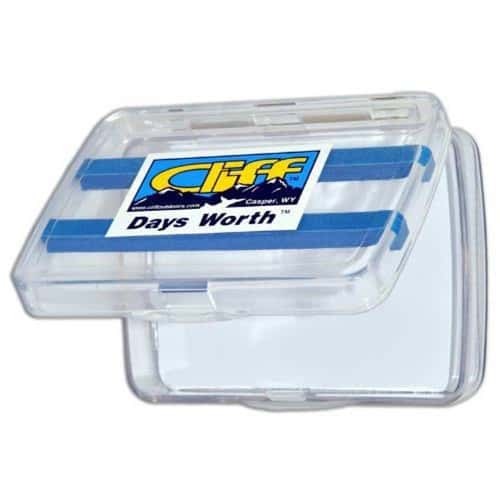 The Cliff Outdoors Days Worth Fly Box has a high energy magnetic pad securely holds small flies. Cliff Outdoors Days Worth Fly Box probably won't make a lot of sense to those anglers out there who feel it is necessary to carry a couple of thousand flies (arranged perfectly by size and color in $100 fly boxes and stuffed in their vest) when they head out for a day on the river. However, if you are the type of angler who knows your home water, knows fish, and only needs a hundred flies or so to cover all the bases, the Cliff Outdoors Days Worth Fly Box is for you.